The rubber toy tyre from KONG has been specially developed for puppies to get through the tooth changing period. The fun toy can also be filled with your puppy's favourite snacks. The mini car tyre from KONG has been specially developed to help puppies in periods of chewing and losing teeth. The KONG Puppy Traxx is made from a soft and flexible rubber that "massages" the gums. The toy tyre can also be filled with your puppy's snacks. Medium/Large: 11cm. Suitable for puppies weighing between 13 and 30kg. This product is delivered at random, you cannot select your colour. 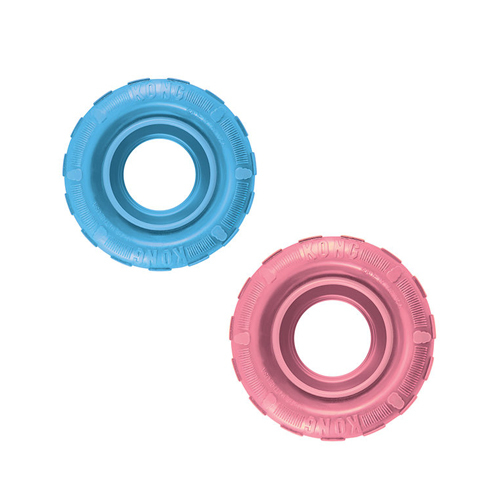 You will receive a pink or a blue Traxx. Have you used KONG Puppy Traxx before? Let us know what you think about this product.